Cockatiels are often quite social and sweet which makes the little parrots wonderful companions to be around and interact with. Most of the colorful birds whistle sounds, rather than talk or imitate speech, and their mimicry skills are off the charts! They can copy the sound of things like a dog barking, alarms, ringtones, thunder, different birds chirping, even a toilet flush, with remarkable accuracy. Whether you happen to be a devoted lover of birds or not, when an extremely talented and adorable one comes along you can always take a moment to stop and appreciate it. The cute gray and white feathered cockatiel in this clip is definitely one of the more gifted birds you'll ever come across and his whistle is right on tune. 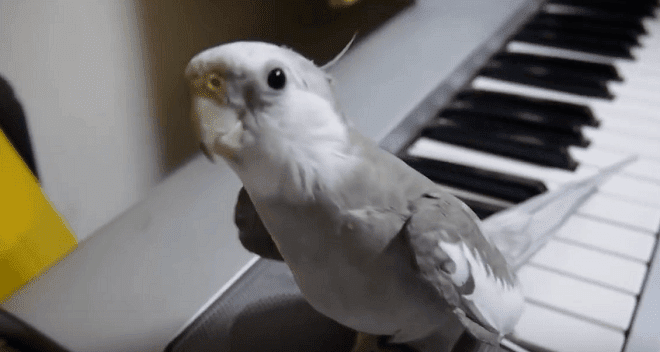 The friendly looking bird is quite the entertainer and loves to sing along with his human companion whenever he plays the piano. Check them out now and have a listen because the little fella has impeccable whistling skills and really sounds amazing! The pair are performing the theme song from the 80s hit Japanese movie My Neighbor Totoro, an animated fantasy film that has become a true classic. The award winning movie is culturally iconic and is now considered one of the greatest animated films ever made. As you can see and hear, the sweet cockatiel knows how to whistle up a storm and carries a tune a lot better than most people can. It's remarkable how on point he is! In the end, the best thing about this entire video is the fact that the friendly bird seems to be having so much fun. His owner really keeps him engaged and what better way to spend time than making beautiful music together!